Successfully Added Camera Lighter + DVR (4GB Silver Copter Edition) to your Shopping Cart. Bringing you the coolest surveillance gadget in the form of a robust lighter, this style hidden video camera with 4GB DVR comes with a micro lens that lets you capture secret footage that no one will ever know anything about! 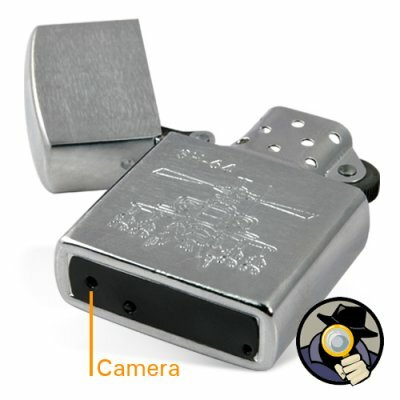 The CVSD-I37 Camera Lighter + DVR is built with an all metal body having a stamped military style helicopter to give the lighters' brushed metal finish an extra touch of authenticity. This looks like a classic lighter in every way, and makes a striking statement without giving away its secret. Have you ever needed to secretly record a meeting, interview or sensitive conversation that takes place someplace beyond your control (another persons office, home, outdoors)? Well, if the setting is something you cannot control or you have no setup time before the conversation, then most " cameras" are simply impractical to use and capture the details. Well, with a lighter type hidden video camera you can easily carry it around with you and openly use it without anyone knowing what you are doing! Having video proof of those conversation is very useful in protecting yourself. For instance, you may just want to record things to supplement your bad memory (I know I do! ), perhaps you are trying to record conversations for later analysis of everything that is happening, or maybe you just want to demonstrate how a co-worker is often taking out of context what you have said in your office just minutes earlier. Whatever the situation, this camera tool can be of great benefit to you if you work in any high pressure environment where everything that happens is vital to your career well being. Does this lighter come in another color? Can the CVSD-I37 work as a real lighter? No. You may be able to drip a drop of lighter fluid on to the thread and light a cigarette, but we strongly advise against doing this since the heat generated form the flame can cause damage to the internal electronic components and will void your warranty.